Scam artists posing as collection agents continue to prey on utility customers across Wisconsin. This fall, a We Energies customer in Waukesha County was victimized by a scam and bilked out of $1,300. And the Milwaukee utility reported more than 600 scam attempts in a month’s time this fall. These scams come in waves, hitting utilities across Wisconsin. Sometimes they target residential customers, and sometimes they target small businesses like restaurants. 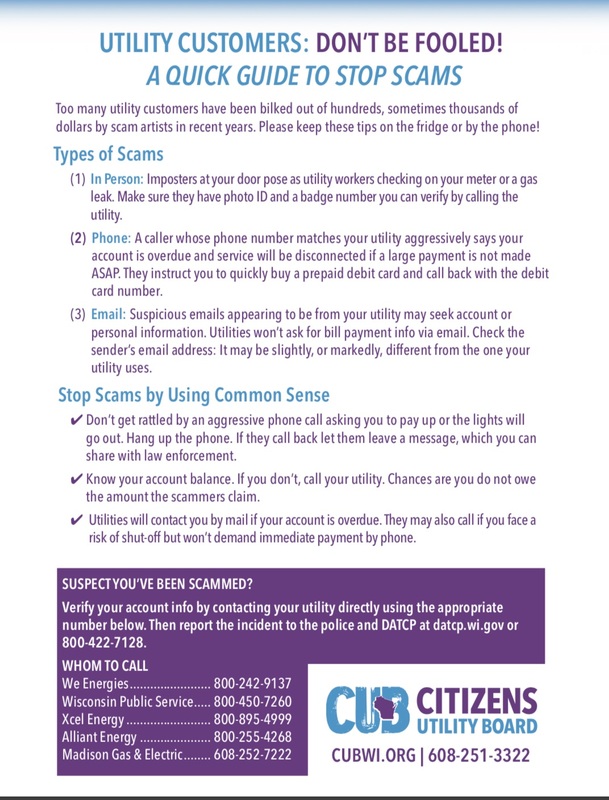 As part of Utility Scam Awareness Week, the Citizens Utility Board has prepared A Quick Guide to Stop Scams to help prevent you from becoming a scam victim. CUB, Your Independent Consumer Voice,is Wisconsin’s consumer advocate for residential and small business customers. The most prevalent scam in Wisconsin is a telephone scam urging customers to pay via a prepaid debit card, with the threat that the power will be shut off immediately. The caller’s phone number mimics the utility’s, leading some consumers to get caught off guard. Be sure to download CUB’s Scams Guide and keep it on your fridge or by your phone. Or take a screenshot and keep it on your mobile phone. ✔ Don’t get rattled by an aggressive phone call asking you to pay up or the lights will go out. Hang up the phone. If they call back let them leave a message, which you can share with law enforcement. ✔ Know your account balance. If you don’t, call your utility. Chances are you do not owe the amount the scammers claim. ✔ Utilities will contact you by mail if your account is overdue. They may also call if you face a risk of shut-off but won’t demand immediate payment by phone. CUB’s Scams Guide is being released as part of a nationwide effort to raise awareness about scams. CUB’s national consumer advocate federation, the National Association of State Utility Consumer Advocates, is a partner with Utilities United Against Scams (UUAS). Wisconsin utility companies that are part of Utilities United include We Energies and Xcel Energy. Last month, UUAS was recently presented with a Fraud Fighter Award for its work to prevent scams. The organization and participating utilities have helped shut down more than 2,200 toll-free numbers used by scammers against utility customers. Don’t let scammers trick you into giving them money. Hang up and contact your utility directly, and report scams to the police or the state Consumer Protection office at 800-422-7128. Previous #GivingTuesday – A Great Opportunity to Help CUB Grow Next Finding Your Voice – What’s Your Role in our Energy Democracy?